Efficient order picking is the primary concern of many businesses today. Toyota Material Handling understands this and has designed the BT Optio series to meet the needs of today's and tomorrow's commercial world, maintaining productivity and driving down costs. The BT Optio H-series offers picking heights up to 12 metres - the highest available on the market today. 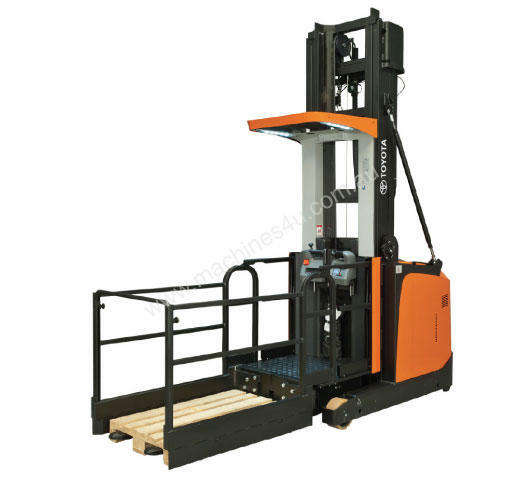 This advanced machine offers high travel speed, acceleration rate, high lift/lower speeds, plus a host of advanced safety features, to take order picking to the next level. Stable gates together with a flat floor allows comfortable and safe picking. Exceptionally good visibility when driving. The BT Optio series of trucks are designed to work effectively in chilled environments. A good working environment for the driver is created by adjustable control panel and backrest.